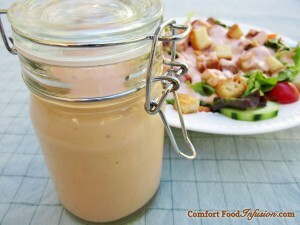 I have some fond memories connected to Thousand Island Dressing. Odd….. Well, no, it’s not odd. All the recipes posted here are connected to a fond memory. I am comforted by all of these recipes because they are tied to positive emotion. Whether that emotion came from a childhood memory, or feeling good about putting something healthy in my body, or because I was privileged to be eating such diverse wonderful flavors from different cultures. Thousand Island dressing was part of my childhood. I remember going out to eat with my mother and grandfather at buffet style restaurants (King’s Table is one that stands out in my mind the most). 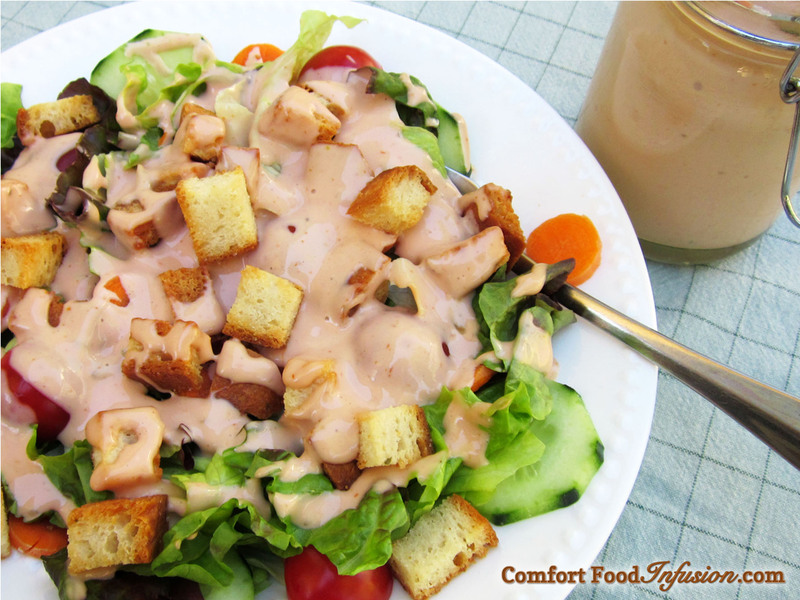 At the salad bar, I would fill my salad plate with croutons and Thousand Island dressing…. that is all. I don’t even remember eating anything else, other than possibly corn or mashed potatoes. Besides the buffets, I also remember that my grandfather’s favorite dressing was Thousand Island, and my mom would always have a jar of her homemade recipe on hand for him. He ate with us every Sunday for spaghetti lunch (a tradition my parents continue today) and always used her dressing on his salad. In honor of my mother and grandfather, I am posting her recipe. Although, the post is not complete without adding instructions on how to make homemade croutons. I limit my gluten intake, but simply can not bear to eat a Thousand Island salad without the croutons. You don’t have to use gluten free bread, you can make croutons from virtually any bread on hand, and it does not even have to be stale. The dressing recipe uses mayonnaise and Worcestershire sauce, but both of those can be found in vegan varieties. Made with mayonnaise, ketchup and relish. Can be made vegan. Put all ingredients in a medium sized bowl. Whisk until well blended. Store in airtight container in refrigerator. Awesome. We were tired of ranch so I started making my own 1000 Island, but I’m anxious to try this healthier version. I also haven’t added Worcestershire or garlic. Sounds great! This recipe is ‘healthier’ now than it was when my mom made it a couple decades ago. There are so many natural, low sugar, low fat brands of mayonnaise and ketchup on the market now… not to mention organic and vegan versions. Welcome to Comfort Food Infusion!